First, you must decide whether you need a “back-half” modification or a full chassis. The advantage to the back-half conversion is its price, subframe, 9 " housing, ladder-bar or 4-link suspension, coil springs , shock absorbers, roll cage, wheel tubs, and sheet metal. To get a back-half car to go fairly fast — say, low 10s — is not that difficult, but weight distribution becomes a problem. Because the rear is so much lighter than the front, it’s hard to make the car perform consistently. If you plan to go quicker than 10.50, you should definitely consider a full-chassis car. If you purchase a Darkside subframe, you have another option: You can start out with our rear-subframe kit now, and install one of our A-arm or strut front frames later — turning your back-half car into a full, rail-style chassis. In fact, our front-frames are specifically designed to be added-on later, without making the finished chassis look like it was built in two parts. With the advent of ultrasonic testing in sportsman categories, there’s a lot of confusion about mild-steel roll cages. We use .134-inch-wall tube to assure that your chassis will pass IHRA and NHRA’s (.118-inch) minimum wall-thickness requirements. ( note: 1/8 inch nominal wall tubing ) Next question: Do you need a Funny Car cage? Our standard chassis is plenty safe without one, but there is a performance advantage. If you want to run better than 8.90s, you should consider one because it makes the car stiffer and, consequently, more consistent. Plus, if you want to feel as safe as possible, it does afford more protection. But you’re going to pick up about 30 pounds extra. A Funny Car cage can usually be added later. Some people believe that 4130 chromemoly cars are stronger than mild-steel cars. Not necessarily! While 4130 tubing is a stronger material, because it’s made out of an alloy steel, the rules let us use thinner material (.083- and .065-inch wall). Thus, a stronger material that has a thinner wall is about as strong as a thicker-wall mild steel. The 4130 chassis is going to be 20- to 25-percent lighter because it’s made out of thinner material; there’s simply less steel in the car. Basically, what you’re paying for when you buy a 4130 car is weight reduction. In a basic chassis, you pay about $1500 extra to save 70 to 80 pounds. Now, some guys would pay a fortune for 70 to 80 pounds. You have to ask yourself: “Could I spend $1500 somewhere else, and be better off?” If you have cast-iron cylinder heads on your engine, and you want a 4130 chassis, you’d be better off buying aluminum heads. If you’re going to go fast — mid-eights or quicker — you probably should get 4130, because mild steel definitely detracts from the resale value of a car like that. The only real disadvantage is that a 4130 car must be TIG-welded. That means every single accessory, bracket and tab has to be TIG-welded. For the first-time, build-it-yourself type of guy, this is not the way to go; he shouldn’t even consider it. 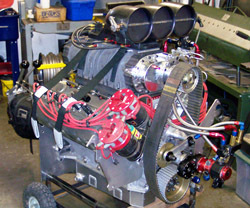 Chromemoly is for a higher-skilled, more capable fabricator. Mild steel, on the other hand, is extremely forgiving. I also hear people say that 4130 is more likely to crack. Wrong again! This tubing was originally developed for the aircraft industry to make airframe parts, and nothing is stressed worse than airframe parts. If this stuff didn’t have excellent fatigue life, it wouldn’t be in airplanes. So, durability isn’t really a consideration. In the front end, you’ve got two choices: A-arms or struts. If money’s tight, an A-arm car is cheaper to build. If you have the money, you can consider building a strut car. The disadvantage to struts is that they cost a little more money. The advantages are lighter weight and better header clearance. In a narrow car like a Monza or Vega, or most big-block cars, header clearance can be a real problem. In a wider car, like a Camaro, it’s not as big a factor because the frame is wider, so the A-arms are farther apart. The modified MacPherson strut is the latest technology. For anybody who’s building a serious car, it’s the preferred choice. An internally adjustable strut must be taken off the car for adjustment of its valving; an externally adjustable strut can be readjusted without removing it from the car. The latter is a very sophisticated piece. In the hands of a person who wants to spend some energy working on it, that’s an advantage — not because of the strut, but because the shock absorber is adjusted externally, and has more control and more variables. A well-equipped strut car is going to be a few hundredths faster than a well-equipped A-arm car. If you have the money, you need to decide. Even with the spindles and shocks that must be purchased along with A-arms, the cost is still several hundred dollars less than for struts. The weight difference is typically between 15 and 20 pounds, depending on the style of frame you’re using. That’s a lot of weight in a 7.90 car, but 20 pounds isn’t worth a dime in a Super Gasser. If you wants to run quicker than 7.90, we insist that he step up to our double-framerail, car. The reason is not that our standard chassis won’t go that fast; it’s just that the kind of horsepower it takes to run that fast will flex a single-rail car excessively. You need the double rails to deal with the extra horsepower. A flexible car takes more power to go the same speed. When you want to run low sevens or high sixes, it takes every bit of horsepower you can find, muster, beg, borrow and steal; you can’t let the chassis use any of it up. Some people believe that a 7.90 car can be upgraded to a 6.90 car, but they’re designed and built completely different. A nitrous or blower motor makes so much torque, and flexes the car so much more, that you need extra tubing and a considerably different design to support this brutal horsepower, so the car will stay flat and track correctly. If you plan to go faster than 7.90, you need the double frame rails and other advantages built into our state-of-the-art chassis. In a lower-horsepower car, double rails can be too stiff. A notable exception is our Nostalgia chassis for older, fat-fendered cars. Because these bodies are so narrow, we can’t put the roll-cage supports in the same places that we do in our late-model cars. The double rail frame is another way to stiffen the chassis. Plus, these older bodies are so tall that we have extra room to make the frame taller, and still fit it under the stock floor. As a general rule, if you want to run 10.50s or slower, install a back-half suspension system. If you want to run low tens to high sevens, build an tube chassis. If you want to go quicker than that, buy the double-framerail chassis. Unlike “slapper bars” and other bolt-on devices, welded ladder bars give you a strong suspension with some basic adjustability. Any ladder bar that uses an adjustable front mount can be adjusted for three things. First is what we’ll call the suspension’s “intersect point” in the chassis. When you raise or lower a ladder bar in its front mount, you’re actually adjusting the intersect point of how the drive loads are applied in the chassis. Secondly, you can adjust pinion angle by rotating the two rod ends at the rear of the ladder bar. Finally, you can adjust the preload in the car by setting one side differently from the other, effectively shifting weight from one rear tire to another. Adjusting pinion angle or preload in a standard-type ladder bar requires removing the bar, then screwing or unscrewing the ends. What’s known as a “double-adjustable” ladder bar allows you to adjust pinion angle and preload in the front intersect point without removing the bar from the car. A double adjustable style is just easier to use. It has right and left threads, so it works like a turnbuckle: You can loosen and rotate the adjuster without taking off the bar. There are two real advantages to having the adjuster in the bottom bar, instead of the upper bar: (1) It’s easier to get to with a wrench, which solves a real problem in many cars; (2) the rod angle goes straight back and straight forward, so you can move it a lot further before the spread between the two tubes gets so great that you can’t put the bar back on the car. Anyone who tells you that short-wheelbase cars need 30-inch ladder bars, intermediate cars use 32 inches and long-wheelbase cars use 36 inches is just showing you he doesn’t understand the big picture. What makes a ladder bar work is dependent on where the front mount is in relation to the car’s center of gravity. A 32-inch ladder bar can be adjusted to have the same intersect point as a 36-inch bar in relation to the car’s center of gravity. The reason everyone uses 32-inch ladder bars is a space consideration. Bars shorter than 32 inches tend to rotate the pinion angle excessively, plus they require a front mount that is very close to the ground. On a long-wheelbase vehicle (like a truck), the 36-inch ladder bar may be the best choice. When under-body clearance is not a factor, the longer bar can transfer weight more easily. A tremendous amount of engineering goes into a properly designed 4-link. There are 4-links on the market that won’t gain you anything, because the spread on the holes and/or the brackets themselves are improperly located. these often use large 3/4 inch bolt and locate them large distances apart Consequently, there are lots of adjustments that you can’t even get to and maybe none that are useable, max bolt diameter should be 1/2 inch. A aluminum 5/8" - ? All 4-links use top and bottom bars of unequal lengths. However, some have a top bar which is considerably shorter. These are commonly referred to as “unequal-length” 4-links. This is definitely an inferior design from the past, when chassis builders were not allowed to modify stock frames. This style causes rapid changes in the pinion angle and the front intersect point. Stay away from these designs! The Darkside 4-link is the most sophisticated rear suspension available today. With its 1/2”-diameter bolt holes, the 4-link adjustments are now much finer and, of course, there are more from which to choose.